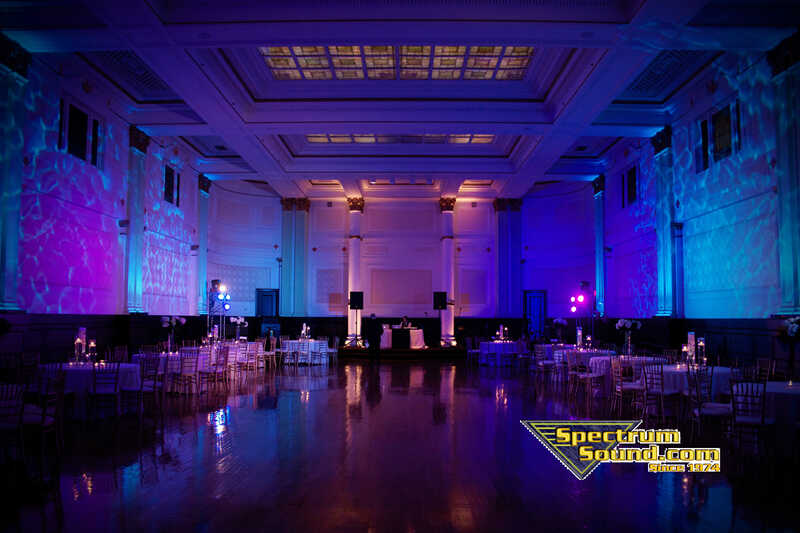 We can take any plain hall and transform it into a magnificent ballroom with creative up lighting. Spectrum Sound Uplighting is the secret weapon for bride’s looking to wow their Guests. And what bride isn’t! Up lighting floods walls and ceilings with a tasteful tapestry of light to create a dynamic and romantic aura to your event. It allows you to spend less on your other décor because up lighting hides the flaws in a hall. At the same time, it enhances its most attractive features. Up lighting can even turn a plain, old gymnasium into an opulent expression of your good taste. And yet we have designed packages to work for brides with modest budgets. You’ll love another favorite feature of Spectrum Sound up lighting: we can create a monogram using his and her initials. You’ll enjoy your first dance basking in the glow of your own, custom spotlight! If you want your wedding to be distinctively you, you’ll want up lighting! I’d like to show you more. Visit our website to see some of the unique lighting designs we’ve created for other brides: We can customize a lighting design for you. If you’re planning a wedding in Southern Indiana or Western Kentucky and want a great wedding DJ, Contact the wedding professionals at Spectrum Sound. And schedule a Free, no hassle consult to get pricing, give us a call at (812) 401-4931. I will send you information based on the feedback from your form, so go ahead. Complete Wedding and Event Production – DJ Entertainment, Photography, Photo Booth, and Videography Services. If you would like to meet the most experienced, fun, and versatile DJ professionals, and Mc’s in the TRI -STATE area, call my office at 1.812.401.4931! DJ/MC/VJ Terry Tunks and his talented team of entertainers have entertained at any thousands of events over the years. Evansville, Indiana, Newburgh, Indiana, Owensboro, KY and all across Southern Indiana and Kentucky. In towns like JASPER, FERDINAND, FRENCH LICK, WEST BADEN, HUNTINGBURG, AND SANTA CLAUS, IN. Based at one time in Louisville, KY As a result of sponsorship of Coca – Cola. SPECTRUM SOUND is just as comfortable entertaining small groups at a casual affair to 18,000 at the THUNDER OVER LOUISVILLE DERBY CELEBRATION.